New Heritage Theatre Group, the oldest Black nonprofit theatre company in New York City celebrates its 55th Anniversary! 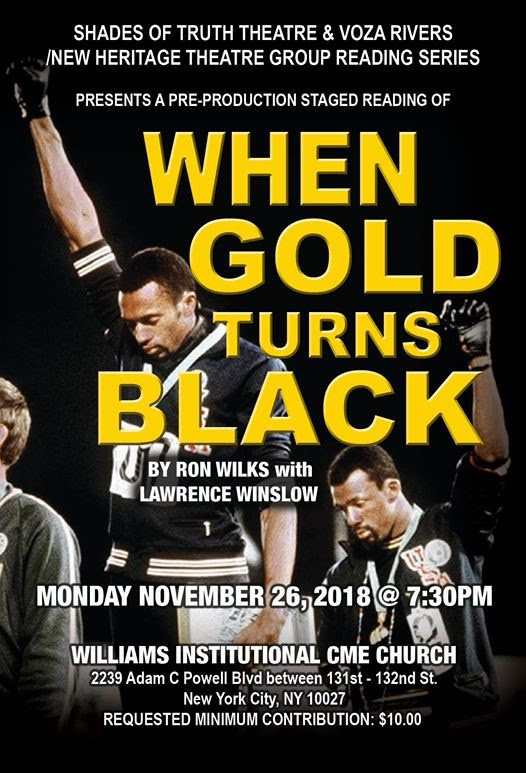 We invite you to a dramatic staged reading that revisits 1968 when two Olympians Tommy Smith and John Carlos displayed their activism by raising their fists as they were awarded their Gold and Bronze Medals for the 200 Meters. The social unrest of the late 1960's coupled with the assassination of Dr. Martin Luther King Jr sent shock waves of fear and hopelessness throughout the Country. It fueled resentment and resolve and gave birth to the black revolutionary. Tommie Smith and John Carlos are both heralded world class sprinters bound for Olympic glory but are fed up with systemic racism and the mistreatment of black Athletes. The two men make a solemn decision to use the world's largest stage to make a profound statement. Their powerful gesture defined a movement and inspired generations. This is their story. Copyright © 2019 New Heritage Theatre Group. All Rights Reserved. Designed by JoomlArt.com. Joomla! is Free Software released under the GNU General Public License.